We’re on the last week of baking rolls from the February issue of Gourmet magazine, and my family thoroughly enjoyed these. The boys liked peeling them apart and Michael and I liked the flavor. The dough was soft and easy to work with, though the rise was not great, likely due to the temperature of the yogurt. I brought the yogurt out of the refrigerator a few minutes early so it wouldn’t be too cold, but next time I will let it come to room temperature or even warm it slightly before mixing, though that’s not mentioned in the original recipe. I brushed on less butter than the recipe called for, and we thought they still had a nice buttery flavor. The recipe below reflects my changes. I work exclusively with instant yeast and modified the instructions for that type, and I included the instructions for active dry yeast in the Variations. If you prefer to use buttermilk per the original recipe, I’ve included instructions on how to make an acceptable substitute in the Variations. 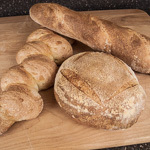 Be sure to visit my friends Kelly of Sass & Veracity, Judy of No Fear Entertaining, Claire of The Barefoot Kitchen, Courtney of Coco Cooks, and Sandy of At The Baker’s Bench to see what they whipped up for the last week of the Gourmet bread challenge. 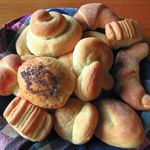 Adapted from Gourmet magazine, 2009. In the bowl of the stand mixer, whisk together the flour, instant yeast, and salt. Stir together the warm water, yogurt (or buttermilk), honey, and 6 tablespoons of melted butter. Mix into the flour until the dough starts to come together. Attach the dough hook and mix on 2 for about 6 minutes. The dough should be smooth and elastic. Put the dough into the oiled rising bowl and turn to coat. Cover with plastic wrap and a kitchen towel. Let the dough rise in a draft free spot at warm room temperature until the dough doubles, about 1-1/2 to 2 hours. Dust your work surface with flour. Punch down the dough, then halve it. Wrap one half in the plastic wrap and set aside. Roll the other half into a 12x12-inch (30.5x30.5 cm) square. You may have to roll slightly larger then trim the ends to even out the square. Brush the surface of the dough with about 1/2 tablespoon of the remaining melted butter. Cut into 6 equal strips, then stack the strips on top of each other. 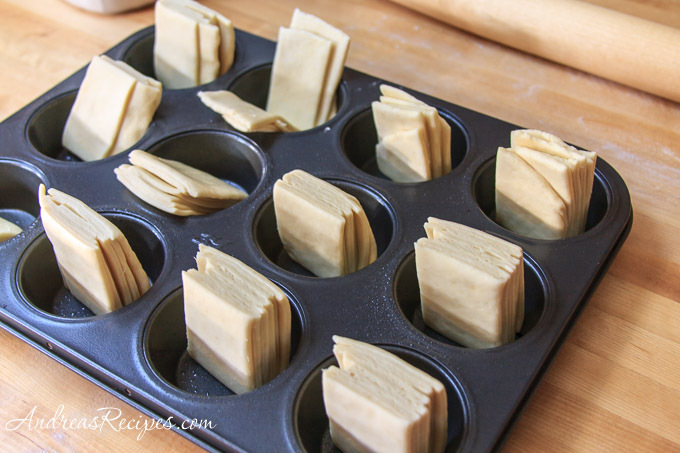 Cut through the layers into 6 equal pieces, then place each into a buttered muffin cup, standing up so the layers are visible. Gently fan them open. Repeat with the remaining dough. Cover with a tea towel and let the rolls rise in a draft free spot at warm room temperature until the dough doubles, about 1 to 1-1/2 hours. Place the rack in the middle and preheat the oven to 375° F/190° C.
Remove the towel and bake the rolls until they are golden brown, about 20 to 25 minutes. Brush them with the remaining melted butter, then transfer to a rack and allow to cool for about 20 minutes before serving. Mix the active dry yeast with the warm water and honey and let it stand until it foamy, about 5 minutes. Proceed with Step 1. If you don't have buttermilk, combine 1 tablespoon vinegar or lemon juice with enough skim milk to equal 3/4 cup, then let it stand for about 20 minutes before mixing with the remaining ingredients. I think these turned out beautifully! I love your variations – I’ll be keeping these in mind if I make them again! Wow, out of all of the dozens (hundreds?) 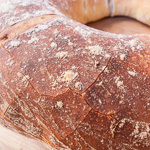 of bread recipes you’ve posted, I think these look the most intriguing. The prep didn’t sound all that time-consuming, so I’ll definitely have to try these sometime for a family dinner or get-together. I’m getting hungry just looking at the pic of the final product! Those really came out beautifully! I found your blog via twitter! Love it! The rolls are gorgeous! I am going to look at your other bread recipes too!! Isn’t dough a miraculous thing? Doesn’t look like much before it meets the heat, but afterwards, these beautiful rolls emerge. When I was a kid, I used to love pulling apart the “leaves” of Parker House rolls. These will be just as much fun. These look delicious. I just love the look of fantail buns! I like the addition of the yougurt. Rising can be tricky. They look wonderful. These look beautiful. I can’t wait to try them out. I love baking with yogurt, but haven’t considered using it in a roll! They look lovely, I especially like the shape! Wow the rolls look lovely! I really love the golden color 🙂 When you cover the rolls (after you put the strips in the muffin tray) with a tea towel, I guess the towel would touch the rolls, right? Is that alright or does the dough stick to the towel? I guess it could be a bit hard to remove it if thats the case. Hi A&N. The dough isn’t sticky once you roll it out. As long as you use a tea towel (smooth weave) and not terry (looped weave), the towel shouldn’t stick. I have them doing it with whole-wheat flour. I was wondering if the yogurt had to be plain and if it was non-fat. Does it make a difference if I use a non-fat yogurt? Hi Dee! Yes, the fat content of yogurt or any other dairy does make a difference in baked goods. 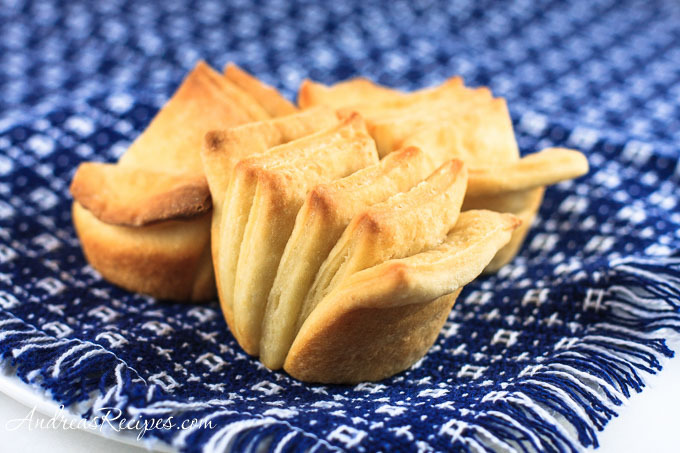 For these rolls I used plain yogurt with all the fat because they turn out flakier. You can use low-fat yogurt, but there will be a difference in texture.